Just after noon on Saturday—three hours behind schedule—China Eastern Airlines Flight 721 broke through the clouds on its ascent from Shanghai Hongqiao Airport. From my seat in the middle of the plane, I turned my head left and looked out the window. For the first time in five days, I saw blue sky. Shanghai doesn’t usually suffer the air pollution woes that plague cities in northern China. As places like Beijing, Xi’an, and Harbin burn coal to get through bitterly cold winters, turning the city skies a queasy shade of yellow-brown, we in the south live without central heating but also enjoy comparatively less bad air as a result (I won’t go so far as to say that Shanghai’s air is “good”). And we also, I must admit, enjoy a tiny bit of what Evan Osnos cleverly dubbed “airenfreude” as Beijingers post photos of wheeze-inducing smog on Facebook and Twitter and we snap shots of blue-sky days in return. How the mighty have fallen. After more than a year of patting myself on the back for choosing not to live in the north, I woke up last Monday to find the AQI (air-quality index) for Shanghai hovering around 300—in between “Very Unhealthy” and “Hazardous.” (All of my numbers come from the U.S. Consulate’s Shanghai Air Twitter feed.) That’s certainly not unprecedented, but it wasn’t welcome. Conditions improved slightly on Tuesday and Wednesday, as we dropped down to “Unhealthy” territory, but then the air grew thick again. By late Thursday, the AQI had gone over 400 for the first time in my memory, and on Friday afternoon we officially crossed the 500 line—“Beyond Index,” or in the infamous term that someone at the U.S. Embassy in Beijing coined several years ago, “crazy bad.” Suddenly, the Shanghainese were the ones posting photos of their polluted air. I did my best to limit my exposure. 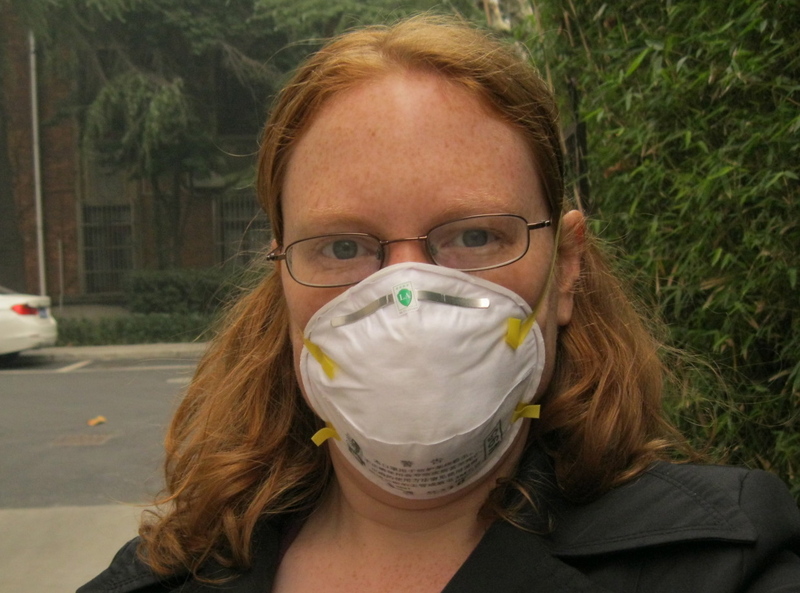 I worked at home all week, rather than make the 30-minute walk to the library, and I wore a face mask for the first time in the hope that it would offer at least some degree of protection against the smog. I calculated my errands carefully: what sequence of tasks would limit my time outside the most? And what did I absolutely have to do? What could I put off? Still, the pollution got to me, and I spent Thursday afternoon trying to sleep off a pounding headache. 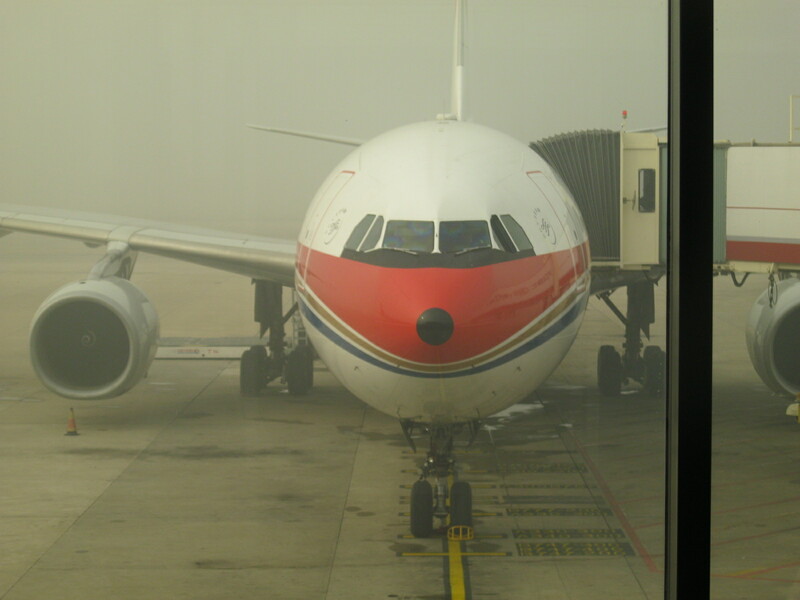 When I showed up at Hongqiao Airport for a flight to Hong Kong early Saturday morning, I discovered that the airport was smogged in; dozens of delayed passengers (including myself) lined up at the windows to take photos of the grimy whitish haze encasing the building. It was so bad that for nearly an hour, I couldn’t see the plane that was allegedly waiting for us at the end of the jetway. Finally, its red nose began to emerge from the mist and the announcements of delayed flights turned into calls for passengers to board planes. But air traffic was so backed up that after we settled into our seats at 10am, we then sat at the gate for two hours while the pilots waited for clearance to leave. Shanghai’s unprecedented smog woes have caught the attention of international news organizations like NPR, and last night I sat in my hotel room in Hong Kong watching the BBC report on the continuing problem. 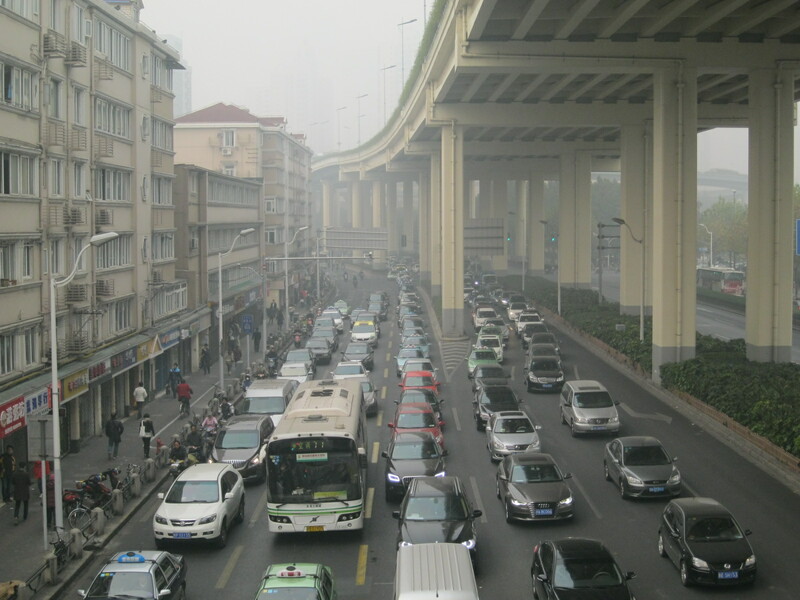 The Shanghai city government has tried to keep people safe by closing schools and canceling outdoor activities, and worked to alleviate the pollution by shutting down manufacturing facilities and removing some official cars from the roads. But the smog has persisted, and at 7:00 this morning, I saw from the Shanghai Air Twitter feed that the AQI is back in the “Hazardous” range, at 442. There doesn’t seem to have been any precipitating event to cause this sudden “Airpocalypse,” just an unholy combination of auto and factory emissions that have stalled over the city. All of this has made me reflect on something that Atlantic journalist James Fallows said on an episode of the Sinica Podcast a couple of weeks ago. Talking about the depiction of China in the American media, Fallows remarked that, “the iconic image of China right now is not Tank Man or Foxconn or a farmer. It’s the sky you can’t see through in Beijing.” And now, Shanghai. The Chinese government has spent huge amounts of money and energy trying to expand its soft power in the world—to make China an attractive place for foreigners to live, work, and visit. The Chinese Communist Party’s legitimacy also depends quite a lot on its ability to convince the Chinese people that improvements in their standard of living over the past three decades are thanks to the CCP. But when flights can’t take off on time, and kids can’t play outside, and the news is full of information about how not to get sick from the air we’re breathing, it’s a little hard to imagine how either of those efforts can be successful. Both within China and without, the downsides of life here are occasionally as plain as the smog in the sky.